Here we see the sisters of DST who excelled in their professional career and awarded for their performance. Indian Solidarity Council a well known organisation honoured Sr.Mercy George DST,Principal St.Joseph Senior Secondary S chool,Narsinghgarh with Jewel of India award and a certificate of excellence for her outstanding achievments and remarkable role in the field of education in Madhya Pradesh. 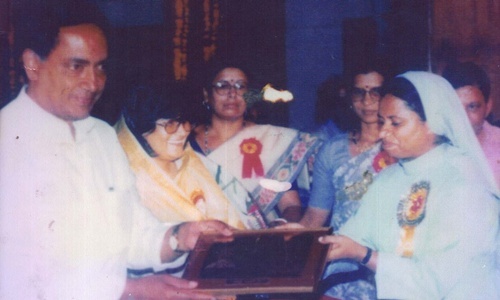 Sr.Anitha Thevarolickal DST,Principal of Prem Sagar Special School, Ujjain received the BEST TEACHER AWARD 0n 19.09.2001 from the Chief Minister of Madhya Pradesh Hon. Digvijay Singh.